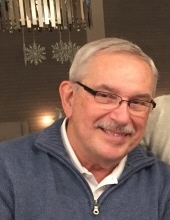 Michael J. Moran, age 72, a longtime resident of Naperville, IL, passed away on March 26, 2019 at University of Chicago Hospital. He was born on February 18, 1947 in Waukegan, IL to John and Matilda Moran, who preceded him in death. Michael is survived by his loving wife, Susan; his children, Ryan (Stephanie) Moran and Erin (Daniel) Clemons; his grandsons, Nolan and Charlie Clemons; his sister, Patti Moran and preceded in death by his brother Joseph Moran; uncle of many nephews; and brother-in-law of Richard (Linda) Lang. Mike attended Purdue University and was a graduate of Roosevelt University. He spent his working career in Information Technology, and retired from Abbott Laboratory in 2013. He enjoyed being a Scout Master and spending time with his children and grandchildren. He was an avid Cubs fan and enjoyed watching golf. Visitation will be Sunday, March 31, 2:00-6:00 PM at Friedrich-Jones Funeral Home & Cremation Services 44 S. Mill St. Naperville, IL 60540. A Mass of Christian Burial will be celebrated Monday, April 1, 10:00 AM at Our Lady of Mercy Catholic Church 701 S. Eola Rd. Aurora, IL 60504. For those who would like to leave a lasting tribute to Michael's life, memorials may be made to the Amyloidosis Support Group, amyloidosissupoort.org 232 Orchard Drive, Wood Dale, IL 60191 866-404-7539. To send flowers or a remembrance gift to the family of Michael J. Moran, please visit our Tribute Store. "Email Address" would like to share the life celebration of Michael J. Moran. Click on the "link" to go to share a favorite memory or leave a condolence message for the family.